This level have normal difficulty and you need to use good technique to complete this level. For this level you should try to play near to blockers to break them and after play more from bottom to shuffle candies everywhere. This will help to break candies automatically plus give chance to make colorbomb. Combine colorbomb with striped candy to break the time bomb and order candies. After play more with green or orange candies and as you get the colorbomb combine it with order color candies to reach the target. Nice, the films on you tube, only the can dies that you need you do not get them. You have to play it over and over again, so boring. 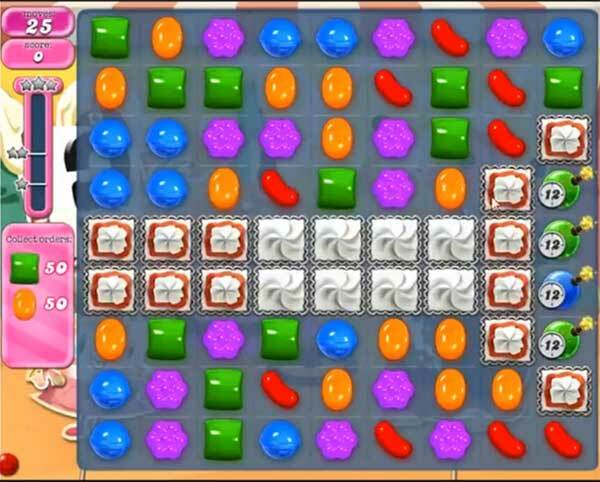 This is not strategie its Just the luck of getint the right candy and combinaties. What a fu** game, crazy. Mine has way more bombs and every time I get rid of them new ones appear. I agree- impossible and boring.